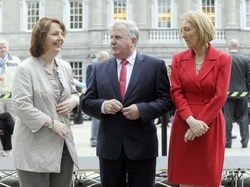 Back L-R: Senator Paschal Mooney, Cllr Paddy Kilduff, Senator Terry Leyden, Cllr. 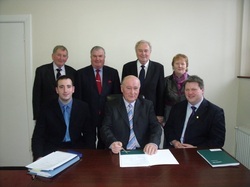 John Cummins, Cllr Orla Leyden, Senator John Ellis, P Burke (Chairman Roscommon CDC), Cllr Eugene Murphy and his son Rian. 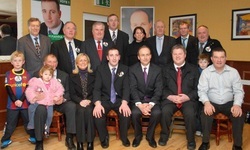 Front L-R: Cllr Martin Connaughton with his three grandchildren Ben, Katie and Martin, Cllr Rachel Doherty, Ivan Connaughton, Micheál Martin, Cllr Gerry Kilrane, Cllr Paschal Fitzmaurice. Fianna Fáil Senator Terry Leyden has called on Taoiseach Enda Kenny to take the lead in negotiations to save hundreds of jobs at the MBNA credit card company in Carrick on Shannon, Co Leitrim. Senator Leyden said: “The news that Bank of America is pulling its credit card business from Ireland comes as a major blow to Co Leitrim and to the entire region. MBNA is one of the largest employers in this area and plays important role in the local economy. “Up to a thousand people working in the Carrick-on-Shannon office are now at risk of losing their jobs. This would be devastating for them and their families, and there would be a serious knock-on effect for the local economy. The Government must do everything in its power to find a buyer for the firm in order to save as many jobs in Co Leitrim as possible. “As a long-standing customer of the MBNA, I can testify to the excellent service provided by the staff in Carrick-on-Shannon. There is no doubt in my mind that MBNA is leaving behind a highly-skilled and well trained workforce that would be an excellent asset to any potential buyer,” concluded Senator Leyden.